Some of Little Baby's non-traditional scoops.Philadelphia’s ice-cream history just keeps getting richer. Already home to Bassett’s, America’s oldest ice cream company, and the birthplace of “Philadelphia Style” (an ice cream that does not contain eggs), our city boasts two unique, independent businesses that are philosphically similar, yet quite distinct from each other. Little Baby’s Ice Cream and Zsa’s Gourmet Ice Cream share a dedication to local ingredients, unorthodox retail venues and a knack for social media marketing, but their flavor profiles are wildly different. Little Baby’s has built a reputation for concoctions that read less like ice cream flavors and more like culinary dares. Try a scoop of Everything Bagel, Pizza or their now classic Earl Grey Sriracha. 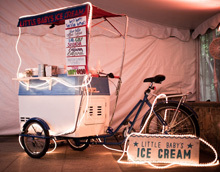 Little Baby's grand opening of its Frankford Avenue location in 2012.Little Baby’s quickly expanded to include three roaming tricycle carts, a seasonal stand at music venue Union Transfer, and shops in Fishtown and the Cedar Park neighborhood of West Philly. 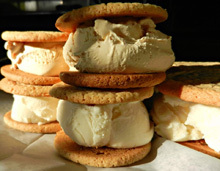 Zsa’s Gourmet Ice Cream also began as a part-time passion for owner Danielle Jowdy in 2009. Together with her fiancé and business partner Parker Whitehead, she began selling ice cream at small farmers markets in the Philadelphia suburbs. The pair make flavors they describe as “traditional with a modern twist,” such as Salted Caramel and Pumpkin Gingersnap. Zsa's Gourment Ice Cream sells cold treats from a revamped ice cream truck. Their flavors were so well received that they decided to invest in an ice cream truck. Jowdy found a vintage truck on eBay, but it was beyond her budget. “I put together this crazy payment proposal to the seller,” Jowdy says, “but little did I know that Parker was on a computer on the other end of the couch telling the seller to disregard anything I was saying, because he was going to buy it outright!” With their new wheels and a small commercial kitchen, Zsa’s began increasing their production, and in 2011, Jowdy was able to work on the business full-time, selling at larger farmers markets and brokering wholesale accounts with local co-ops. The two companies agree on approach—both produce small batches using seasonal and local ingredients—and where to get their milk and cream: Trickling Springs Creamery.